When Will The Fed Step In To Rescue Markets? 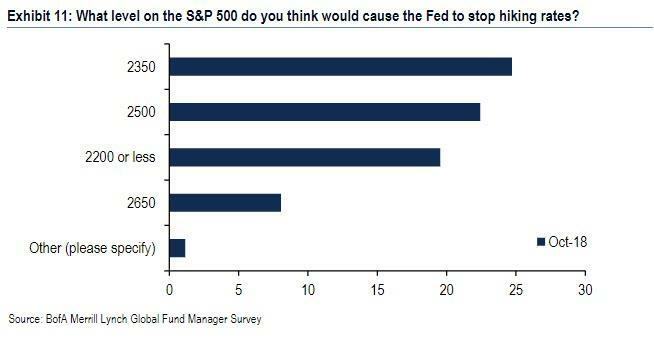 In a time of rising concern about stock markets, as one of its questions in the latest Fund Managers Survey released last week, Bank of America asked "what level on the S&P 500 do you think would cause the Fed to stop hiking rates?" What it found is that according to the respondents, the Fed would stop hiking if the S&P 500 fell to 2390, suggesting the "Powell put" strike price is about -12% below current levels. On Thursday morning, with stocks having wiped out their 2018 gains and with increasing worries about a market that is seemingly no longer backstopped by a central bank, Bloomberg picks up on this theme and notes that with "global investors swimming in a sea of red", they have become consumed with one magic number: the strike price of the so-called Powell Put. It found that to the chagrin of those used to central bank intervention, for now at least Wall Street says that the $2 trillion drop in U.S. equities this month has yet to tighten financial conditions enough to levels that would spark a dovish monetary offset. That’s even as Goldman over the weekend calculated that the bank's Financial Conditions Index (FCI) has tightened by 32bp since October 2 - a number that has likely increased modestly this week - noting that "the recent stock sell-off was the major driver of the tightening, as shown in Exhibit 1." Lack of notable tightening aside, what are the specific price levels that could trigger the Fed to engage in a wholesale market recovery. According to BNP Paribas, a 6% drop in the S&P 500 Index to 2,500 would be the resistance level that would prompt a response from Powell. "A 10 percent to 15 percent drop in equities is usually the difference between noise and signal," BNP Paribas analysts said in a note. Meanwhile, Evercore ISI has put the "Fed Put" below the 2,650 mark, compared with the S&P 500 Index’s closing level at 2,656 on Wednesday. Two weeks ago, after the latest two-day rout, Krishna Guha, the head of central bank strategy at Evercore ISI, warns that it will take a correction of at least 10 percent to get the Fed’s attention and even that probably won’t be enough to derail expected interest-rate increases..
A10% drop from the S&P’s record close of 2,930 would put the "Put" at around 2,638, just over 70 points below the current level in the S&P. A 20% plunge would take it all the way down to 2,345, a level not seen since the middle of 2017. Other are more skeptical: BlackRock and River Valley Asset Management say the real economy remains relatively insulated from the stock meltdown. Andre de Silva, global head of emerging-markets rates research at HSBC, was even more blunt, telling Bloomberg TV on Thursday that the Fed needs something “more dramatic” than a stock rout to convince them to stray off course. To be sure, looking at corporate bonds - a key component of financial conditions - where the market rout has yet to inflict much pain, the HSBC analyst may have a point: the spread of junk bonds over investment grade credit has narrowed about 14 basis points this year and has barely budged wider, largely due to a sharp drop off in supply. Meanwhile, the Fed itself has been cryptic with its "market rescuing" intentions, with officials downplaying bouts of market volatility in 2018, citing the health of the U.S. economic trajectory and the tight labor market. Still, some have noted signs that the Fed's mind is changing, and after last month’s Fed hike, Anand Ramachandran at River Valley Asset Management said that Fed Chair Powell hinted at the prospect of a pause in the hiking plan. "He tackled it twice -- first by pointing out that market valuations are at the higher end of historic ranges, and from that perspective a correction would not be unusual,” the Hong Kong-based investor said. “Second, after a repeat question on the topic, he stated that the Fed looks at secondary effects and the nature of corrections." Arguably the most comprehensive take on the Fed's new put came in April of this year, when Deutsche Bank calculated the level of the new "Powell Put," noting that one can estimate the strike of that 'put' in two different ways. First, delta neutral, in which a rise in vol is compensated with lowering of the strike in such a way that the underlying is unchanged. Using this approach we find that the S&P drop started at the point when S&P was at 2800 which places the new strike of the Fed put somewhere in the 2300 — 2400 range. Adding that the "Fed put is embedded in the beta, which represents response of stocks to rates rise. Higher strike, i.e. lower deductible, implies a more protective Fed; lower beta corresponds to a higher deductible or a lower strike of the put." And as shown above, where previously the beta was 10, it has since jumped to 30, meaning that the Fed remains highly protective (as Bank of America repeatedly showed before). According to Kocic, "this is a residual of the Fed's awareness of the distortions caused by QE as well as the market's vulnerability to stimulus withdrawal." 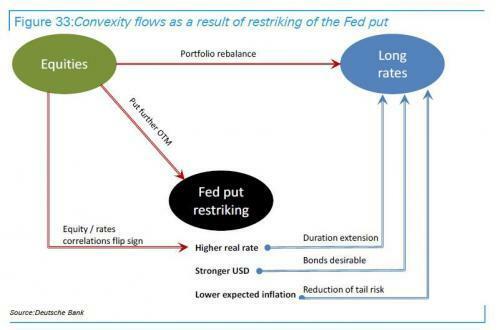 Restriking of the Fed put is re-syphoning of convexity. Withdrawal of convexity from equities means higher volatility and their underperformance, which fosters preference for bonds and reinforces their stability. This becomes a supply of convexity to rates and, as monetary policy remains in place, this means: higher real rates, stronger USD, and lower expected inflation (which reduces the tail risk of the bond unwind). All of these make bonds more desirable than risk assets. For now, bonds have been relatively immune from a "great rotation" out of equities - the 10Y is trading around 3.13% without any buying panic observed, and with rate vol stable - which begs the question if instead of looking at stocks, the Fed isn't looking at bond yields instead to decide if and when to come to the market's rescue yet again. For now, there are no signals that Powell is planning on intervening any time soon.